...this system and service is bar none the top one. We look forward to helping you Secure and Automate your home and business. Protect your business with security that goes the extra mile to keep you aware and in control -- from anywhere. Our friendly technician will provide quick and clean installation of all your in-home automation, safety and security devices. Our ADT monitoring centres provide alert monitoring and have direct lines to emergency services as well as contact with you. After installation we will provide you with the device documentation and provide complete training of all your devices. Contact us directly any time and we will be here for you to answer any questions or concerns. Our skilled technician can provide you with a full onsite review and provide helpful automation, safety and security recommendations. After a year we will contact you directly to follow up with you but please contact us anytime. 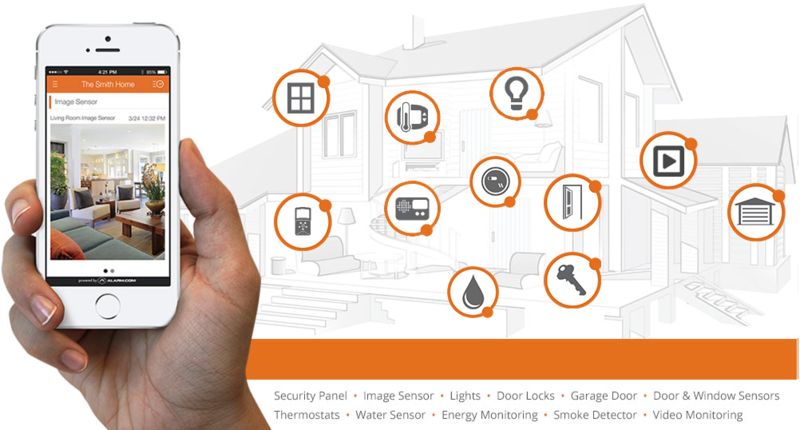 One mobile app lets you control your security system, doorbell camera, thermostat, lights, locks, garage door from anywhere and at anytime. We can assess your situation and recommend services which would serve you best.